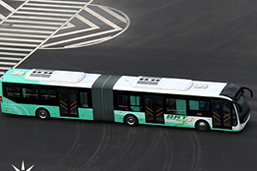 Double-decker bus is a special bus that has two storeys or decks to transport mass people in one time. It is very common in some countries of Asia, such as Bangladesh, Sri Lanka, Thailand, and Singapore and so on. 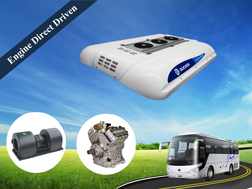 To improve the comfortable performance of double decker bus, the person concerned begin to concentrate on adding double decker bus air conditioner. Double decker bus HVAC equipped with rear-mounted air conditioning units, can achieve multi-layer, multi-area temperature control, this air conditioner has a compact structure design, optimum double-layer air duct design, lightweight design, and the integrated layout, which is easy to install on the decker bus and provide passenger with cool air and comfortable climate in the hot summer, also help improve the balance and stability of the double deck buses. 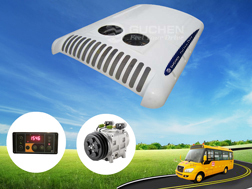 Guchen Industry can supply GD series ac unit for double decker bus, the cooling capacity is 33KW to 55KW; apply for 9-14 meter double decker bus. 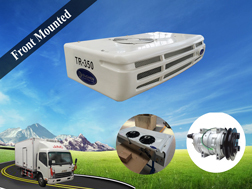 It is integrated bus air conditioner; mount on the inner side and back of bus, with two air outlets, one blow air to the second deck people and another blow air to the fist deck people to make both sides feel cool in buses. 1. 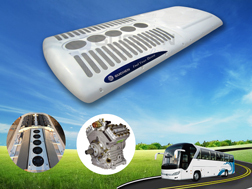 This two deck bus air conditioner is intended for double deck buses. 2. Cooling capacity is up to 47300 Kcal/h, with low noise and low power consumption. 5. 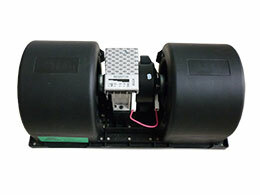 Optimized double-layer air duct design, that make air flow more uniform, evenly, gentle and comfortable. 8. 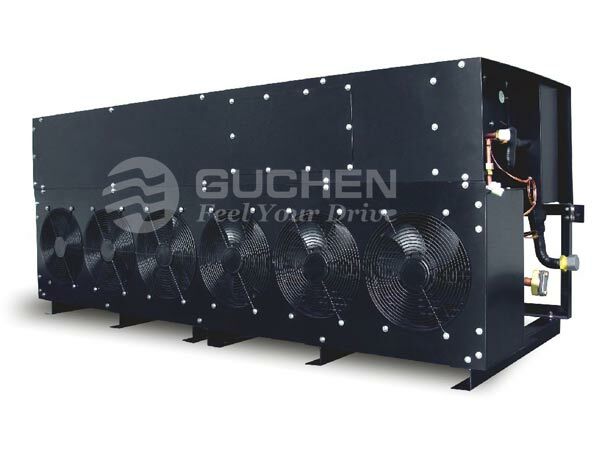 The heat exchanger, also called condenser coil, uses 7 mm internal thread copper tubes, hence the heat transfer coefficient is very high, and ensure the air conditioner has a better energy-efficiency ratio. 9. 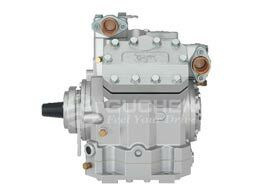 Adopted the patent technology of condensation water heat recovery, the new technology used in the international market, to ensure that guchen’s air conditioner are environmentally friendly and energy saving. 10. 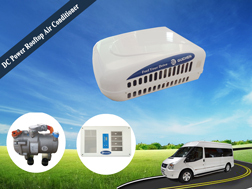 Digital-displayed automatic temperature control function and failure automatic diagnosis system, make the air conditioner’s operation and repair becomes extremely simple. 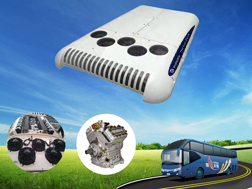 GD series rear-mounted double decker bus air conditioner has a high refrigerating capacity, which is adapted to a variety of 10-13.7 double decker buses under the standard conditions, it widely applied for double decker tour bus, double decker rv, two-deck school bus, double deck city bus, two-layer public buses. 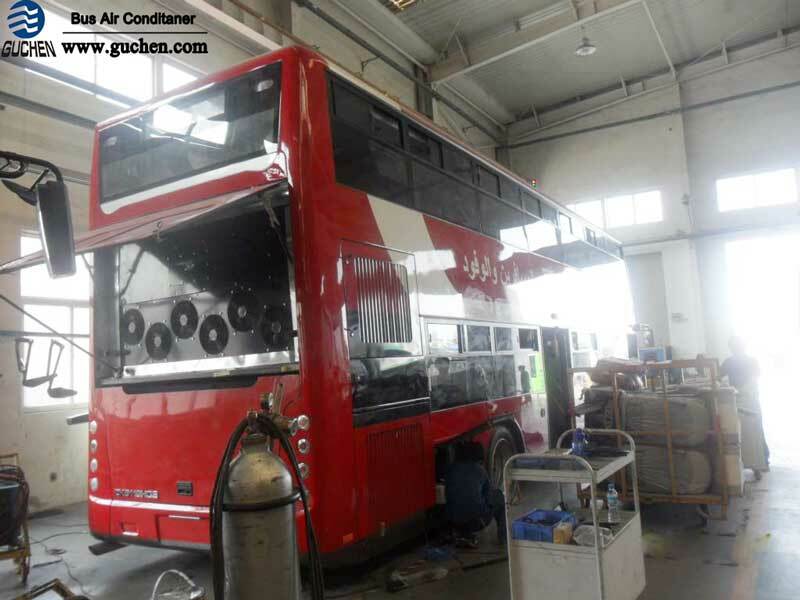 Here is the photo about Guchen double decker bus air conditioner units to Iraq 11 meter length double decker buses project. 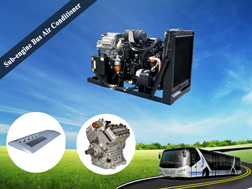 According to the Iraq local bus body client feedback that, they are very satisfied with this double decker bus ac, with the big cooling capacity, even it has crowded people in buses, the cold air is enough a lot.